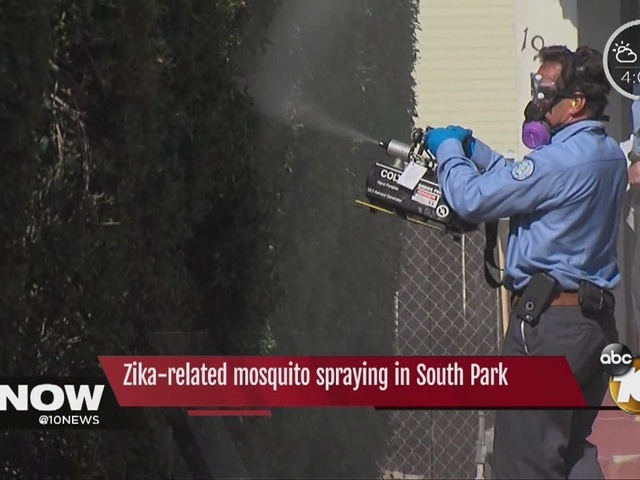 SAN DIEGO - County officials began hand-spraying a two-block area of South Park Friday in order to prevent an outbreak of mosquito-borne diseases. 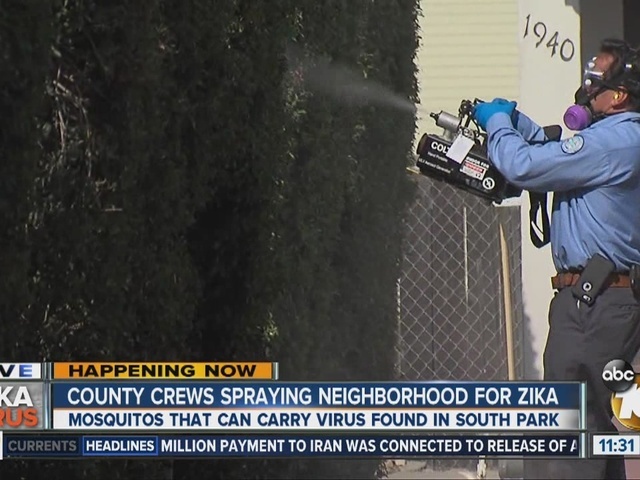 The spraying happened in a neighborhood bounded by Grape Street on the north, Elm Street on the south, 31st Street to the west and 32nd Street to the east. 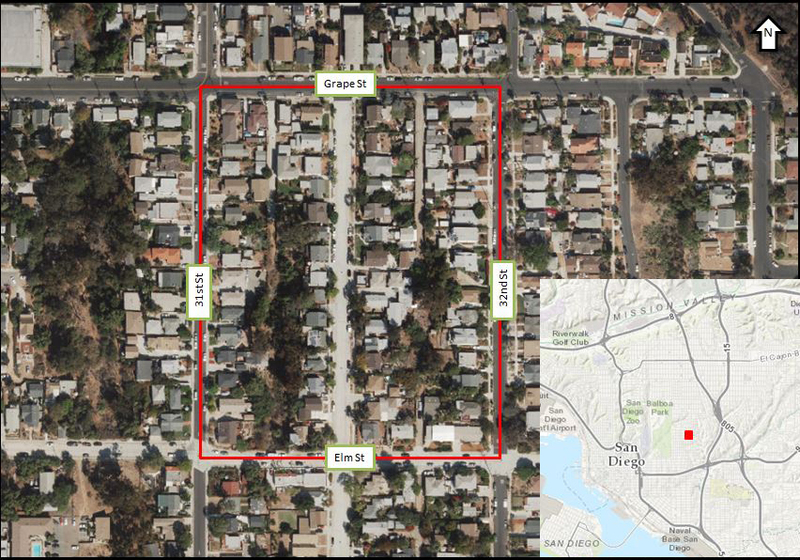 According to county vector control, Aedes mosquito larvae were found in the area where a resident was sickened by a possible mosquito-borne illness. The unnamed person contracted the disease elsewhere. In an abundance of caution, county officials wanted to make sure whichever illness he or she has doesn't spread to the local mosquito population, which would then infect area residents. Adult Aedes mosquitoes can transmit tropical diseases, but none have ever been found in San Diego County carrying any infections. "Although there has not been a confirmed case of any disease in this situation, we are taking appropriate steps to minimize potential risk and protect the public's health," said Dr. Sayone Thihalolipavan, the county's deputy public health officer. The sick resident traveled to a country where tropical diseases like chikungunya, dengue fever and the Zika virus are active, and developed symptoms upon returning home. State officials are expediting tests to determine if the person has a mosquito-borne disease. Normal activities can be resumed a half-hour after the treatment. Vector control plans to continue trapping for Aedes mosquitoes in the area and nearby locations for several weeks. Some South Park residents told 10News they aren't happy about the county's plan, which they learned about on Thursday. Jane Delozier doesn't want the county spraying pesticide in her daughter's backyard. Delozier is visiting from Mexico and staying with her daughter. "I have a problem with pesticides being sprayed around; I think it's something we should have a vote on or a say on," said Delozier. The county says even if the person tests positive for Zika and gets bitten by a mosquito locally, it will take roughly a week for the insect to develop the virus. The spraying on Friday will kill the mosquitoes before the incubation period is up. Delozier doesn't think the spraying will work. "You have to go to every single tiny pocket of water and spray it because that's where mosquitoes hatch; they have larvae," said Delozier. She is also not convinced the pesticide being used will not harm pets or children. "Wouldn't you think another choice would be to alert the people in a neighborhood and give them a choice of products that didn't do harm to the environment or themselves or their children?" said Delozier. Plenty of other people welcomed the preventatives measures but weren't overly concerned. "Since it really isn't a strong case right now, I'm not going to change my lifestyle," said Casey Bondoc. Officials reminded all county residents to prevent mosquito breeding by getting rid of standing water in saucers, old tires, buckets and the like; avoid bites by remaining indoors at dusk and dawn when mosquitoes are most active, and wearing long sleeves and pants. Report daytime bites or discoveries of Aedes mosquitoes to vector control at 858-694-2888.